A few months ago, two little, cute, furry guys in need of a new home arrived at The Pet Food Center. 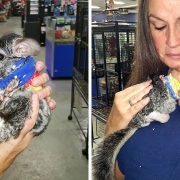 Initially, there wasn’t anything particularly special about these chinchilla littermates, and it was “business as usual” for employees at the store. That all changed one morning when Vicki Butler, Animal Director at the Pet Food Center, discovered one of the little guys had somehow managed to trap his leg in the cage while playing; suffering a major break. The little fella was immediately rushed to the vet, but the news was dire. There were only two options: amputation or euthanasia.